Estampe delivers online saving for a wide varity of stock and custom forms used in every ADP dealership's fixed operations service department. We can help you cut over-head cost on the auto service department business forms you use everyday to run your business. If you wish to order custom ADP forms, please call us at 1-866-348-6414 for a custom quote. These Self-Inking Stamps are perfect for forms that must be stamped frequently with the same message. These stamps are IDEAL Medium 100, have re-inkable pull-out pad and print in Red ink. Plastic Steering Wheel Covers - High Quality and Disposable: We offer 3 different designs: 1) "Shower Cap" style stretches from 21" to 24”, 2) Double Elastic - stretches to 24” and 3) Extra Large - stretches to 28”. This Auto Service Key Drop Off Box is the high quality "classic" design used for many years by hundreds of dealerships and repair shops all over the country. Produce your own oil and lube change stickers, coupons and reminders with this high quality Zebra® oil change service reminder printer. Zebra® is the leading thermal printer in the quick lube industry for printing static cling labels used as oil change and service reminders. These Oil Change Reminder Labels for the Zebra Printer are the most economical available. Plus! ...they're 100% compatible with the Reynolds and Reynolds® and Colonial Systems®. Of course, these oil change reminders also work perfectly with Estampe's Oil Change Sticker Printing System (or any other compatible system). You can choose from Blank White or Blank Clear and the static cling design or the labels produced with a light adhesive and you can choose from two sizes - 2-1/4" x 1-1/2" or 2-5/8" x 1-7/8", depending on which size is programmed for your machine. Custom Design the Top of Your Oil Change Sticker: These custom oil change stickers are designed to be used with Estampe's Oil Change Sticker Printing System. However they also work with a wide variety of other machine printed oil change stickers. For example, they're 100 % compatible with the Reynolds and Reynolds® and Colonial® systems. Contact us and we'll send you samples to compare to your current system. 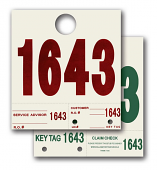 These economical generic oil change labels work perfectly with Estampe's static cling printing system. You can choose from the static cling design or the labels produced with a light adhesive and you can choose from two sizes - 2-1/4" x 1-1/2" or 2-5/8" x 1-7/8", depending on which size is programmed for your machine. Our oil change labels and ribbons are 100% compatible with Reynolds and Reynolds® and Colonial Systems®. You save BIG because generic oil change labels cost half of what other custom printer labels cost!